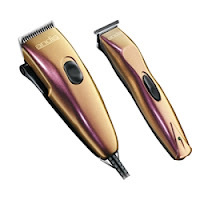 Pure Spa Direct Blog: Stylish Clippers To Go With Stylish Haircuts. If you are looking for a combo of clippers and trimmers for your salon or barber shop, take a look at the Andis Colorwaves Clipper Trimmer Combo Red/Orange Finish. You want style - they have it! You want durability and versatility, they have it. These clippers have a silent professional pivot motor which will allow you to move with the contours of your clients' heads. The trimmer has fine cutting teeth essential for your line-ups, shape-ups and trimming of beards and mustaches. The best thing about this trimmer is that you can make it a cordless trimmer if you wanted, making it more convenient for you, with less wires. This will make it easier and faster for you to get your clients what they want, a better looking haircut. Take a look at Pure Spa Direct, we have tons of items that will satisfy your cutting and styling needs.